This recipe is basically one of trial and error that constantly evolves each time I make it. It began as a recipe from a French cookbook for Zucchini Quiche. Well, since neither Justin or myself particularly like zucchini, I changed that right away to other vegetables. I tried broccoli (which is good when the florets are realy small) but we just love spinach. So spinach it is. By the way, spinach is a SuperFood so it's nice to find a way to eat it without noticing the vegetable-ness. I have also changed up the cheese blend and every time it's good no matter what I use. I happen to prefer Colby-Jack, or a Mexican blend, but sometimes I use whatever is on hand. Sometimes it's a blend of provolone, cheddar, and Swiss cheese. We love cheese so it always tastes good. 1. In a large pan, sautee the onion in butter until it becomes translucent. Add garlic and cook about 1 more minute. 2. Add ham and spinach to the pan. Cook over medium heat until spinach has thawed. Stir often to brown the onion and garlic bits without burning them. 3. Evenly spread spinach-ham-onion mixture in bottom of pie shell. 4. Sprinkle cheese over spinach-ham-onion mixture. 5. In a bowl, beat together the eggs and milk. Season with salt and pepper. 6. Carefully pour egg mixture over everything in the pie shell. If any cheese floats, poke it down with a spoon so it's submerged in the egg mixture. 7. Bake in a 400 degree F preheated oven about 35-40 minutes or until a knife inserted in the center comes out clean. 8. 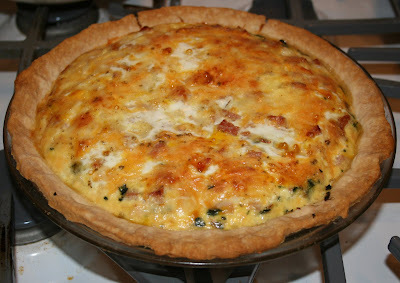 Let quiche cool 5-10 minutes before serving. It will be easier to cut and remove from the pan. Note: If the pie shell starts to get too brown, take strips of aluminum foil and cover the edges to protect them from the heat.